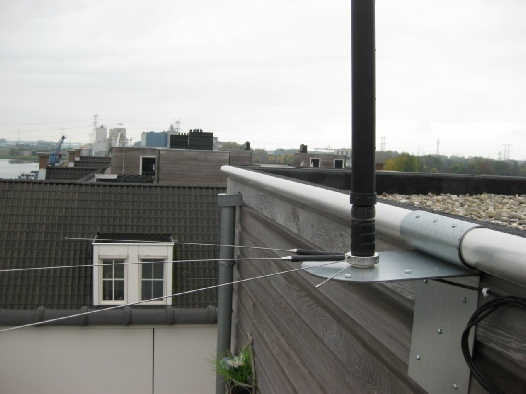 A possible solution if you live i a apartment-building like i do, is the use of a small Mobile antenna on the Roof or balcony. To make use of the lower HF bands, you need an good Counterpoise ! 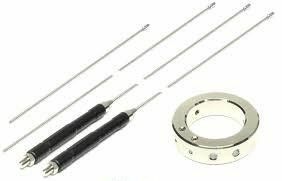 The Yaesu ATBK-100 is a VHF/UHF Counterpoise Kit for the ATAS 100/120 family of Active Tuning Antenna Systems. This ATAS-antenna original was development to use with special Yaesu Tranceivers equipped with the ATAS-system (Active Tuning Antenna System). For using this antenna with other tranceivers, you need a external ATAS Controller, (e.g. MFJ-1925). I Used the ATAS 120A in combination with my Yaesu FT-897D tranceiver. 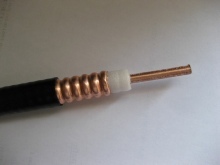 This antenna also can be used with the Yaesu FT-857D en the new Yaesu FT-991 Tranceiver. They have the ATAS tuning system build in. See the picture below to understand how it works. The ATAS-120A is usable on HF from 6 to 40 mtrs band. 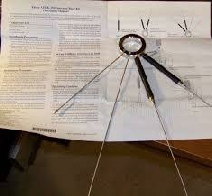 Some HAMS have second thoughts about this kit, but i can tell you that it really works to give this omni directional some preferred radiation on 6 en 2 meters and 70 cm. As I told you before, i Live in a apartment-building at Geertruidenberg. My apartment is on the groud-floor. The Owners Association in 2012 gave me permission to put up a small antenna for Ham radio purposes. I even got permission from one of the owners to put the antennes on his storage-place on the top level of this building ! Total hight is 15 meters. This was much, better than placing a antenna on my own place on the Groundfloor. This storageplace, actually a small outhouse, has a surface of 12 m2, and has a Zinc Roof. Ideal for me to use it as a Counterpoise for my ATAS-120A antenna. I made a design and a sketch how i wanted to mount the antenna. My Son in Law, who works i the metal industry, provide me with the things i needed. The whole thing consists of 2 parts. A bracket to mount against the side ot the outhouse, and a pre-formed plate to mount on the Zinc Roof. All parts are made of Zinc plate, so i don’t have problems with voltaic corrosion. Another important part was the Antenna Base to place the ATAS-120A on. It has to be a sort of SO-239 female connector. 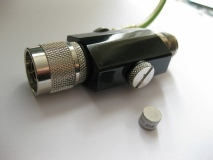 The base of the ATAS-120A has a kind of UHF connector, type PL-259 like. Afther searching the Internet, i found a appropriate antenna-base in a CB shop. Afther that, i had all the parts and i could assembled it all together. 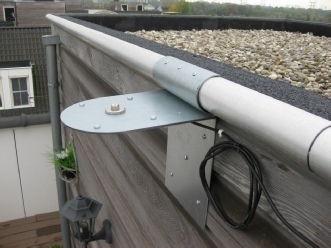 To make shore that all parts of this Bracket and the antenna-base make good contact with the Zinc Roof, i put electrically conductive paste between the parts. But I could not find this paste in Europe (!) So i must ordered it in the USA. Afther the paste was delivered, i could mount it all together on the roof. My first experiences with this ATAS-120A, mounted on the Zinc Roof are very good. Tuning on al HF bands is very good and almost without any problem. Only the 15 Mtr band somethimes won’t tune automaticaly. But manualy via the menu of the FT-897D, it always works fine. No problem to be QRV on all bands. Only 80 mtrs band is not available with this antenna. But i’m glad i can exercise my hobby again, having new experiences. I’ve noticed that during my absence of almost 10 year much is changed in our World. 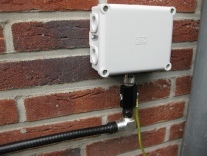 Yes, thats a saying in Holland… hi..
I’ve put some extra turns in the coaxcable and below on my terrace, where the antenna goes into the house, i use a overvoltage protection with fuses. The antennacable, who goes down from the roof to the terrace, is a sturdy boy…hi.. This cable shuld last for many years. Becqause the antenna is on the roof with someone else, i can’t go there every time i want to change anything. The coaxcable i’ve used outside is a Cellflex LCF 12-50-D kable (its diameter is 16 mm) I accidently get my hands on this cable and the connectors. So no worries about losses…hi..
From there i go futher with Aircel 7 Cable into the house and to my shack. In between i’ve mounted the Overvoltage protection. If you want to know more of this ?